A man is spat out of a helter-skelter slide into a pile of teddy bears, in a small crescent-shaped room; beginning a surrealistic life’s journey. Various other performers also have this initial introduction, and each at their ‘birth’ is adorned with a wedding dress. Once dressed in the bridal attire and whipped up into excitement by a clipboard-wielding businesswoman and four men puffing away on cigarettes, they step out of their isolated bunker with eagerness to seek out the happiness that the white gown has promised them… and the set caves in. As soon as the walls have hit the floor, they are blasted into a landscape made up of mobile cubicles assembled out of work desks, computers and lamps, each precariously supported by four small trolley wheels. Gecko’s use of mobile scenery is strong, as always, and is used to drastically and quickly transform the set and setting; fifteen performers may be swinging from the cubicle lamps and a second later all but four of them have exited the stage, the remaining few cramped into one cubicle. Engaged in an aggressive business meeting, the interior of the box they are encased in has turned from grey to red, with cigarette smoke slowly emerging from the gaps in its frame. In The Wedding, these bureaucratic machinations are the extension of the invisible antagonistic force in the piece, which explores the relationship between the individual and the state. We witness a marriage breakdown and an office party turn to violence without ever being provided with the reasons why. At first the deterioration of the figures on stage seem to be brought on by flaws in their character, yet as the piece develops, the fast-paced world they live in is revealed to be the cause. This is embodied in Gecko’s signature use of object and body manipulation: figures are contorted by poles attached to their limbs, and are constrained by the rapidly changing space, which flusters them into a rage. Although the tonal shifts in The Wedding are aggressive and sudden, the rhythm of the piece expands and contracts itself with ease, in unison with the changing physical space. This assists the piece in encapsulating a variety of different life trajectories: the grandeur of the bourgeoisie dining above a wave of undulating office workers is quickly replaced by a family of four living out of a suitcase – literally – entertaining the audience for spare change. We are periodically given a glimpse of the benefactors behind the demise on stage: faceless, Edwardian-fashion-sensed elites watching from afar. The majority of the figures on stage are lit from directly above. As the light shines through the haze, the space above the figures becomes noticeable, as if they all reside at the bottom of a great well. The lighting illuminates them from beneath, making them glimmer brighter than anyone else that they tower above. Coupled with their ghostly presence, it’s insinuated that they are influencers in this machine of pain that the piece depicts. There is a strong sense of fatalism throughout the piece, or rather, an examination of fate and how to revolt against it. Towards the end of the piece, the figures tear off their wedding dresses, and pull the faceless elites down from their pedestal where they throw them around and beat them in a celebration of taking back control of their own destiny. Theatre Re’s Birth possesses a similar sense of fatalism and shares a similar theatrical language. In Birth, Theatre Re use their own brand of tightly choreographed, rhythmically driven physical theatre which carries the audience’s emotions along with the fluidity of its musical score. The score is present throughout the performance and assists in conveying an emotional journey that stretches across three generations. The piece plays out the history of one family and examines prenatal loss of life. 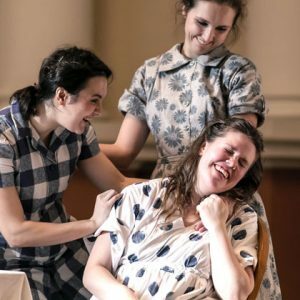 As a heavily pregnant woman delves into her deceased grandma’s diary, scenes from her family’s past unfurl onstage and are pieced together as though they are being imagined into existence in front of us. The passage of time is quick in Birth, and what moments stick around the longest seem to be what has the most emotional weight for the granddaughter (just as our own brains decide what memories to retain). This race through three different lives is achieved through startlingly magical transitions using a gigantic cloth, visually echoing the two most recurrent locations in the piece: the bed and the dinner table. The characters also echo one another in their behaviour: the way both mothers are worried about their daughters leaving home, the way each of the two daughters introduce their spouse to the family, and the way they dance and sing together, are all significant points within the piece that help to build a visual demonstration of the likeness between the women, and makes their lives seem like one big continuous journey. This repetition of fate is a big part of what helps Birth tug at the audience’s heartstrings, but also frames their existence as a determined event. Even when the fourth generation of the family is lost to a stillbirth, although it is a surprise for them, it seems just as pre-destined as everything else in this piece. Much like Gecko’s The Wedding, Theatre Re’s Birth presents people pulled through lives they didn’t choose, yet unlike The Wedding, Birth shows a possibility of comfort within the cycles. The fact that all three women have so much in common is something that allows them to bond and live happy lives, and gives the granddaughter memories to save her during her grief, whereas in The Wedding, the system is presented as having little to no upsides. What is interesting about these two pieces, when seen within a few days of each other at the same festival, is that they both belong to a realm of physical theatre that is concerned with bodily control, and yet use their physical prowess to illustrate a definitive lack of control that we have over reality. Gloomy? Not quite. At the heart of both pieces is a depiction of people as naturally good-hearted. In between the emotional gauntlets, both The Wedding and Birth’s characters are resolutely carrying on through life, just doing their best, and it seems that the performances share a wish for the world to reward them for doing this. Featured image (top): Gecko: The Wedding. Photo Richard Haughton. Theatre Re: Birth was presented at Shoreditch Town Hall 10–13 January. 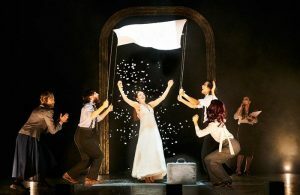 Gecko: The Wedding was presented at Barbican Theatre 24–26 January.